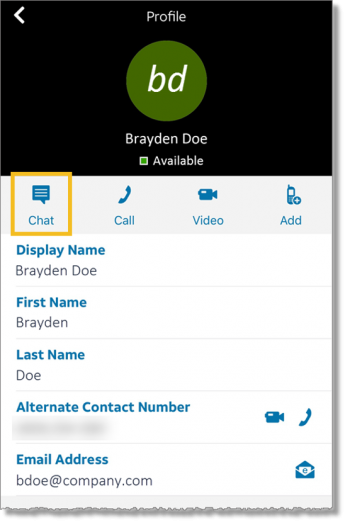 You can chat with all members or specific members in a workspace, or in private with one other team member. Workspace chats are visible to all members of a workspace. Because workspaces are permanent, the chat history will be saved. A private chat is between you and 1 other workspace member. Private chats are hosted in a 1:1 workspace. 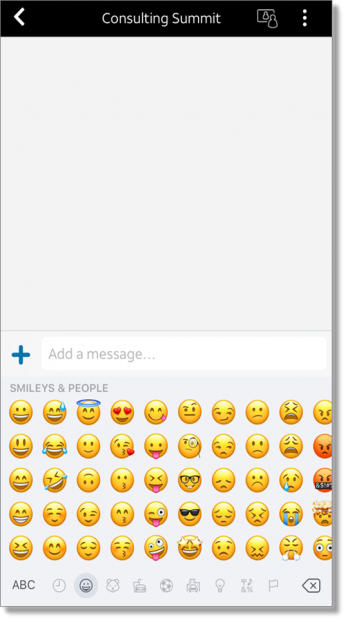 You can enhance your chat messages using GIPHY® and emojis. The AT&T Collaborate app is integrated with GIPHY, so you can search a large online library of animated GIF files to post as chat messages. 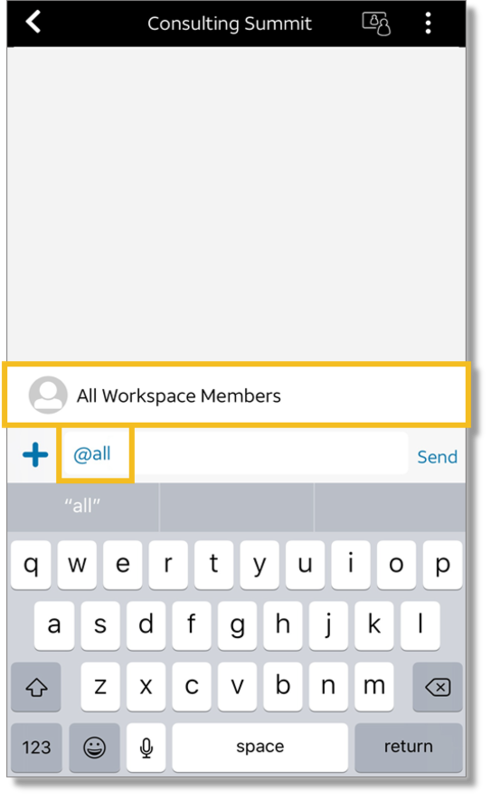 To start workspace chat with all members of the workspace, in the message box, type “@all”, and then type the rest of your message. 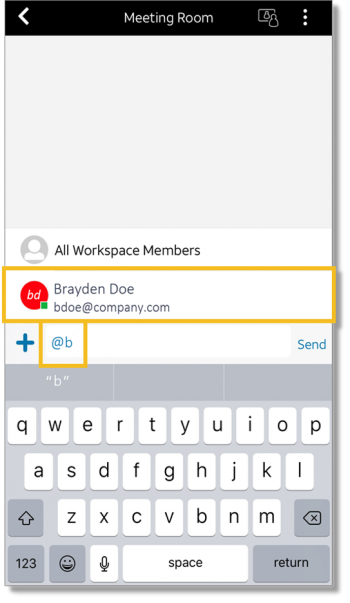 To start a workspace chat with just one member, in the message box, type “@” followed by the member’s name of select the member’s name from the menu that appears. Click the Chat icon at the bottom of the profile window. On the chat bar, click the GIF icon . Enter a keyword, and then click Search. Select a GIF and it will appear in the chat flow. On the chat bar, click the emoji icon . Browse for the emoji you want. Click the emoji to add it to your chat message. To mention specific team members in a chat, enter “@” followed by the member’s name, or select the member’s name from the menu that appears. When you mention another member in chat, they’ll be notified depending on how they’ve set up notification in their user settings. To mention everyone in the workspace, type “@all”. 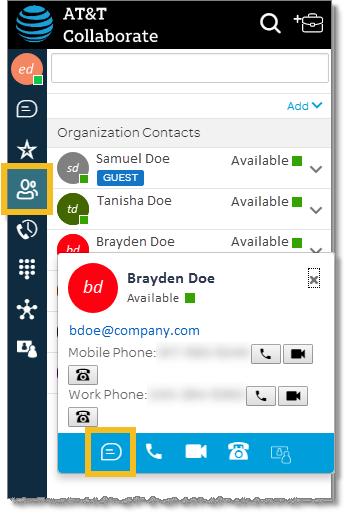 If mentioned members are not in the workspace now, they will receive both email and notifications in the Collaborate app about your message. To start workspace chat with all members of the workspace, in the message box, enter “@all”, and then enter the rest of your message. 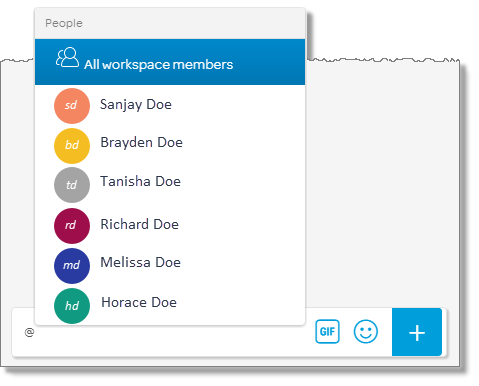 To start a workspace chat with just one member, in the message box, enter “@” followed by the member’s name or select the member’s name from the menu that appears. Tap Chat in the menu. A private chat window will open. On the message type pad, tap the emoji key . The emoji menu appears. 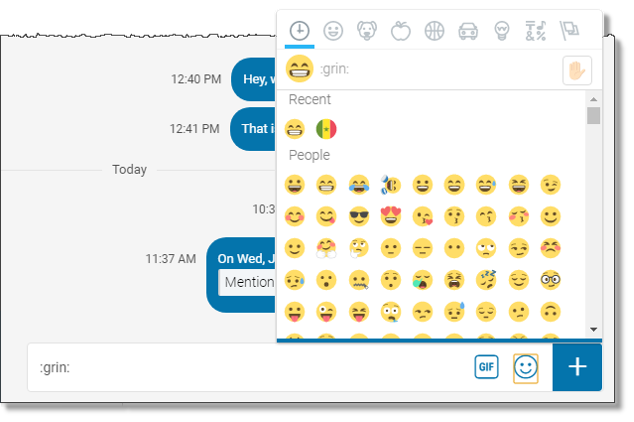 Tap the emoji to add it to your chat message.